Posted on June 6, 2016 at 4:53 pm. To celebrate the launch of Bicicleta, the new soccer themed pokies game from Yggdrasil, Leo Vegas Casino has opened an exciting pokies tournament, giving players the opportunity to claim a share of a $5,000 prize pool. The promo is only running from the 3rd to the 8th of June, so head on over to LeoVegas.com to secure your place in the running today. In addition, the top 100 players appearing on the leaderboard will all go into a raffle at the end of the promotional period, where an additional $1000 in cash prizes will be awarded. Not a bad incentive for a game that’s already packed with bonus features and lucrative rewards. Bicicleta is the second soccer themed pokies game we’ve seen in recent weeks, following the release of NetEnt’s Football Champions Cup pokies game. 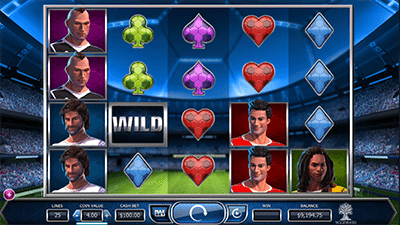 Sports fans will fall in love with this vibrant slot game, which features not just the free spins bonus but also wilds, a wild reel, sticky wilds and a trophy bonus. It’s a five reel, 25 fixed pay line game, where the reels are set against a stadium backdrop full of cheering fans. Symbols consist of soccer players and diamond, heart, club and spade symbols with a soccer ball design. The RTP in Bicicleta is 96.3%, and it carries a minimum bet of $0.25, with a maximum of $100, making it suitable to players of all bankrolls. Whether you’re a soccer fan or not, Bicicleta is well worth a try, for its huge winning potential if nothing else, and there’s no better time to take it for a spin than during the Leo Vegas $5K tournament. Spin your way to a goal today! The Bicicleta pokies tournament is only available to registered, real money players at Leo Vegas. If you’re new, sign up for an account with Leo Vegas Casino and claim a $100 matched deposit bonus plus 200 free spins when loading AUD to your account for the first time.